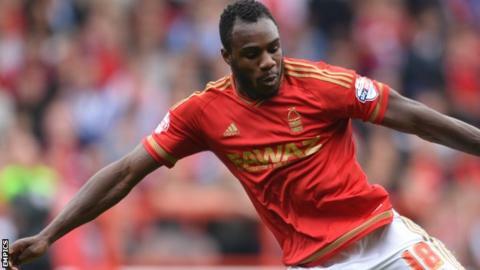 Nottingham Forest manager Dougie Freedman says he had no hesitation in restoring midfielder Michail Antonio to the side at Bolton on Saturday. Forest received a bid for the winger from local rivals Derby last week. The 25-year-old was left out in midweek against Charlton with Freedman saying he was "not in the right frame of mind", but he returned at Bolton. "He trained very well in the last couple of days, so I had no problem," Freedman told BBC Radio Nottingham. "He is a grown man. He will have ups and downs - and bumps and bruises - along with way, but I had no doubt about putting him in. "I think he can perform better than he did, so lets get that out of the way and get Michail back into some form."